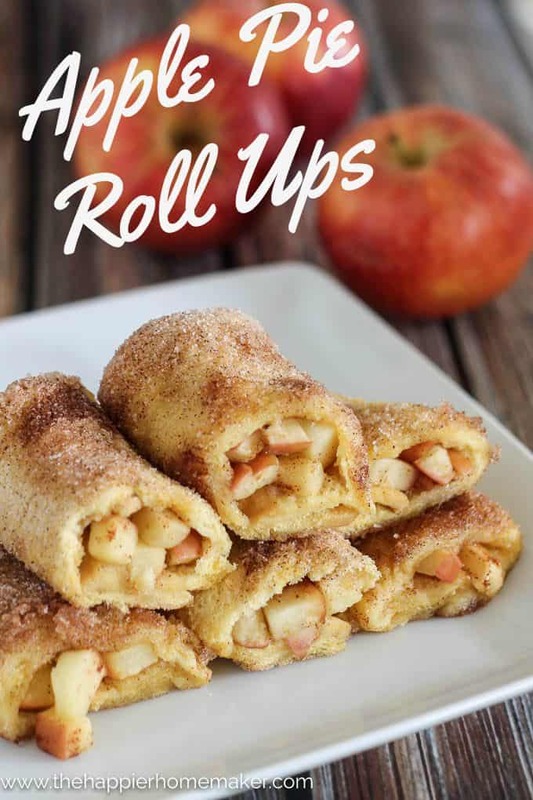 I’m not sure whether I would classify these delicious Apple Pie Roll Ups as a breakfast or dessert. On the one hand they taste like the cinnamon toast I used to get at breakfast as a little girl as my grandma’s house…but they also taste remarkably similar to apple pie and could easily be served as a dessert as well! These are a favorite at our house, especially in the autumn. They are fast to make and easy enough for the kids to prepare (with a grown up’s help for the oven of course!) I hope you try them and then hop back over and leave me a comment letting me know what you think! First a little note: I do not peel my apples before dicing them but that is my preference-feel free to peel them if you prefer. I also do not cut the crust off my bread although I have seen other versions of these roll ups calling for that. Call me the mean mom but that is one thing I’ve never done for my kiddos-but feel free if you are a crust-free family! Preheat oven to 350 degrees and prepare a baking sheet with parchment paper. Use a rolling pin (or your hand!) to flatten the slices of bread. Divide the apples between the bread slices and sprinkle each with 1 tsp of cinnamon sugar. Carefully roll the bread around the apples and place in the butter on all sides, then in the cinnamon sugar to coat. Place on the baking sheet. Bake for 15 minutes or until crisp. Let cool 5 minutes and serve warm. Here’s a little video I made showing how easy they are to make! 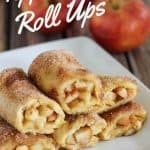 These easy to prepare Apple Pie Roll Ups can be breakfast or easily served as dessert complimented with some vanilla ice cream! Use a rolling pin (or your hand!) to flatten the slices of bread. 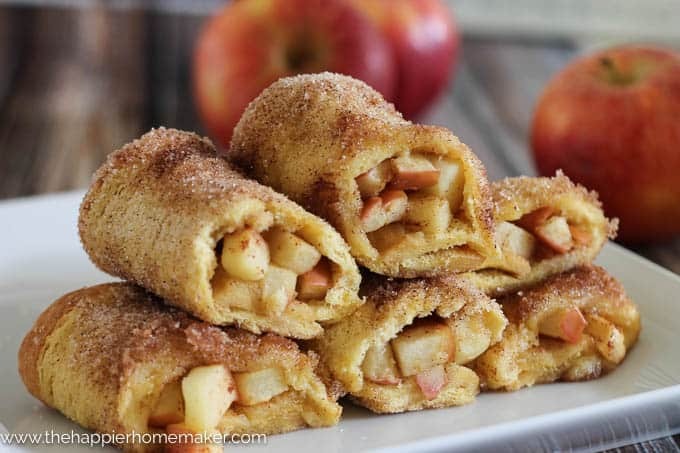 Divide the apples between the bread slices and sprinkle each with 1 tsp of cinnamon sugar. Carefully roll the bread around the apples and place in the butter on all sides, then in the cinnamon sugar to coat. Wondering if you can use pie crust instead of bread..*Pillsbury ready made pie crust? I haven’t tried that Donna but if you give it a go before I do I’d love to hear how it turned out!! I’m trying to right now! We’ll see how they turn out. Love how simple this is to make. Yum!! Thank you Faye-I hope you like them! These look delicious. Like the perfect little snack for the fall! I bet they would be awesome at a brunch party! Thank you Mary Leigh, I hope you like them! Do you know if these freeze well? And if so, should they be frozen before or after baking? I have not tried freezing them Tiffany but I think they would end up soggy if you did. Melissa desde Colombia te felicito por esta formula tan rica, la voy hacer y te contare como me quedaron.Te deseo muchos exitos. ¡Gracias Mercy! ¡Espero que te guste! I tried this yesterday and my bread kept breaking apart! Help! Sounds wonferful. Would flour tortillas work with this? Just trying to use what i have on hand. Just made these used strawberry jam, then apples…yum! I’m so glad you liked them Danie! !